Another is the Nordstrom’s employee, who provided a refund for a set of car snow chains when the company didn’t even sell snow chains. Immortalised in books and customer service meetings these stories are legendary but should you be trying for this level of service? If you’re looking at it in customer satisfaction (or Net Promoter) terms, it doesn’t really pay off. It’s not the level of service that is important in a business but the level of service relative to expectations. This is the reason why a McDonalds franchise and a top flight restaurant can both score 10s in their customer surveys; completely different experience, completely different expectations, same high score. Customers want you to deliver exactly what you say you’ll deliver and maybe just a little bit better. Typically, there’s no expectation that you will substantially over deliver on what you’ve promised. 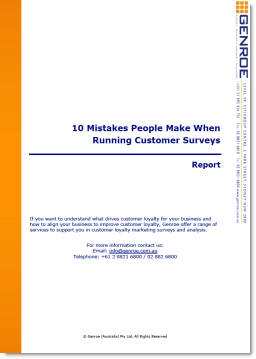 We see this time and time again in our analysis of customer feedback. Almost without fail, when we analyse what drives customer loyalty, “do what you say you will do” ranks in the top three. Besides, just deliver what you promise and you’ll already be ahead of many of your competitors. Speaking of expectations, remember, all that over-delivery drives them up. If you massively over deliver to a customer this time, then it will lift expectations next time, for a never ending spiral of costs. I’m sure you have bought that special someone an extravagant gift and know how “over delivery” this time sets you up for next time. The next gift giving occasion is so much harder, on both sides. Perhaps the most problematic element of stellar over delivery is consistency. In practice, it is impossible to put this type of customer service into any kind of process or training. You just can’t write, coach or teach any consistent structures or design approval limits that will have a front line person consistently delivering pizza to customers while on hold. Actually, I think it’s quite selfish for superiors and managers to exhort their staff to provide unspecified WOW customer service. It’s easy for managers to flash up a PowerPoint slide at the annual planning meeting or in the new employee induction session. But it has no real definition and no way for an employee to reliably deliver. If you can’t reliably deliver a service attribute, across all employees, it’s not particularly useful. Finally, Those Stories Aren’t Even Directed At You! But here is the real reason that Zappos service is not for you: you’re not the audience for those out of the park service stories and neither is your company. The audience is not even Zappos or Nordstrom’s customers. The actual audience for these tales of customer service daring do are the staff of Zappos and Nordstrom. These companies have explicitly chosen to compete on exceptional customer service. Having made such a decision they need a way to drive that culture deep into their business. One of the ways they do that is by telling stories; tales of magnificent customer service with customer facing staff as the heroes. Management encourage these stories and employees understand that great feats of customer service are highly valued by the organisation. They become the role models to which everyone aspires. These stories are very important for employees, but only Zappos employees not yours. Unless your organisation has decided to compete on outstanding customer service, Zappos like customer service is not for you. It is unlikely to be supported by senior management. They will try to write rule books on what is and is not acceptable, which, of course, totally defeats the idea. I know when I go online to Amazon and purchase something, I’ll get exactly what I asked for. I’ll probably get it a day or two before they say they’re going to deliver it, my deliveries are to Australia so overnight is not an option. But I’m essentially getting exactly what I want, when I asked for it, and how I’ve had my expectations set. If you’re looking to deliver good service, that’s a great start: do what you say you will do. It will put you ahead of many organisations and you don’t even have to buy pizza for everyone. Not many companies, if any, can duplicate what Zappos has done in the world of customer service. Zappos is an amazing customer service role model, and they do a fine job of teaching us their methods and philosophies, which have been shared in numerous articles and books. But, that doesn’t mean we should try and copy them. No, we should learn from them, and adapt, not copy, what might work. Shep — I agree completely about duplication of the Zappos service and you are correct we should learn what we can from their model. However, some of the depth of their service comes from the culture that is probably impossible to duplicate – so it becomes their ongoing competitive edge.. I totally agree with Shep. Customer satisfaction is a low mark which as you say may put you in a top rank but in my experience if the goal isn’t to exceed expectations they will rarely reach them. Zappos doesn’t order pizzas daily. Day in and day out the meet those expectations. This is because they are working towards exceeding and when the opportunity arises they hit it out of the park (that’s 1 sure promoter!). The name of the game is wait for your pitch. Swing for base hits…and…when your pitch come hit it out of the park! How could that have happened? Is that supposed a benchmark? Agreed, we should learn and emulate not try to copy as that would be impossible. It’s not about how great “they” are. It’s about how great YOU can be! It is also that companies must find their own sustainable competitive advantage. Zappos has customer service but your company might compete on something different. True Adam, but when push comes to shove, unless one has something so unique you can’t get it anywhere else, it’s going to boil down to who the customer prefers to do business with. An example might be that Xyz Co may have a better product or that they have a zillion locations where their products are everywhere, but their Customer Service stinks, but the moment Abc Co does the same thing and has excellent customer service, Clients from Xyz which were not have a great customer experience are going to flock to Abc and I would even be as bold to say… pay a little more! A well written article. Well done! Thanks – I’m glad you liked it.